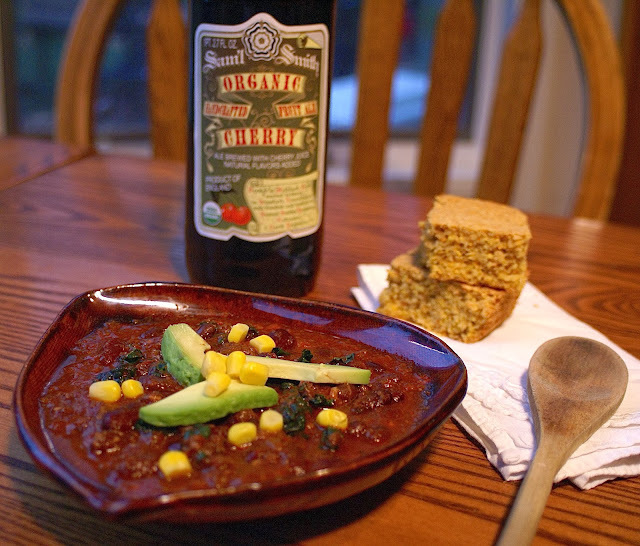 There is nothing better than a big bowl of chili on a cold, winter day. 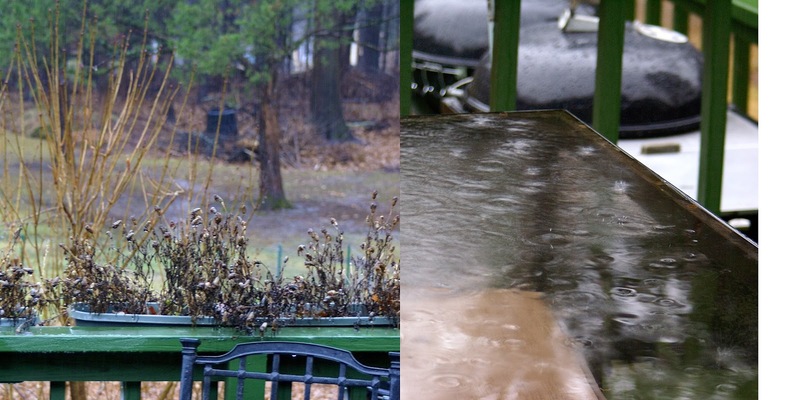 Today it was actually raining, but was still cold and dreary. Chili is the right food to make on such a day. Naturally I made cornbread to go with it. 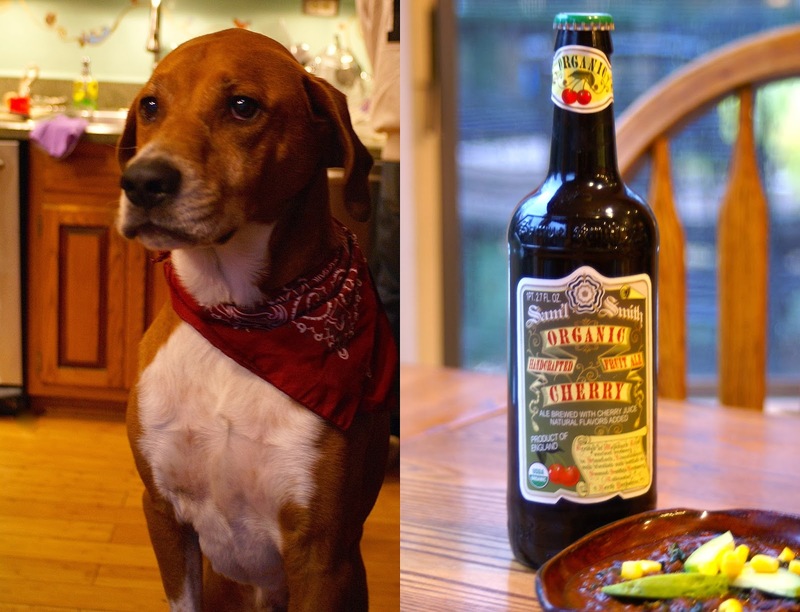 I have to say, with my favorite organic beer in one hand and a bowl of chili in the other, I was a very happy girl watching Sunday night football 🙂 Oh, and Charlie was greedily watching me hoping I would drop a crumb. I can’t resist that face! My dad has taught me just about everything I know about chili. He is somewhat of a chili master. I adopted my recipe from his and added my twist on his classic. I added extra cumin, paprika, and cayenne pepper along with chili powder as well as ground chia seeds and kale. Yes, kale. Now I know a lot of you are thinking I’m insane for putting kale in chili, but just give it a try. Also, ground chia seeds made their way into this hearty dish. Remember my rant about how amazing chia seeds are? I can’t resist finding ways to sneak them into everything I make, so in this chili they work as a thickener. You can’t taste or detect them at all, the only think you’ll notice is a nice, thick consistency. Thank you chia! I also make this chili with dry beans, different than most recipes which call for already cooked beans. 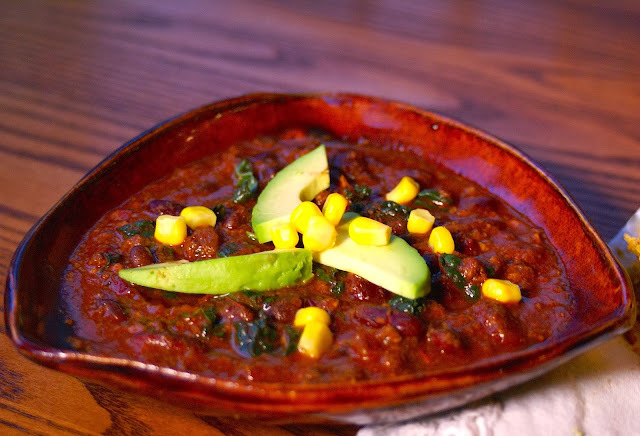 By cooking dry beans with the rest of the chili ingredients they absorb all the delicious flavors and make each bite that much more tasty! Just soak the beans for a few hours or overnight and you are good to go! 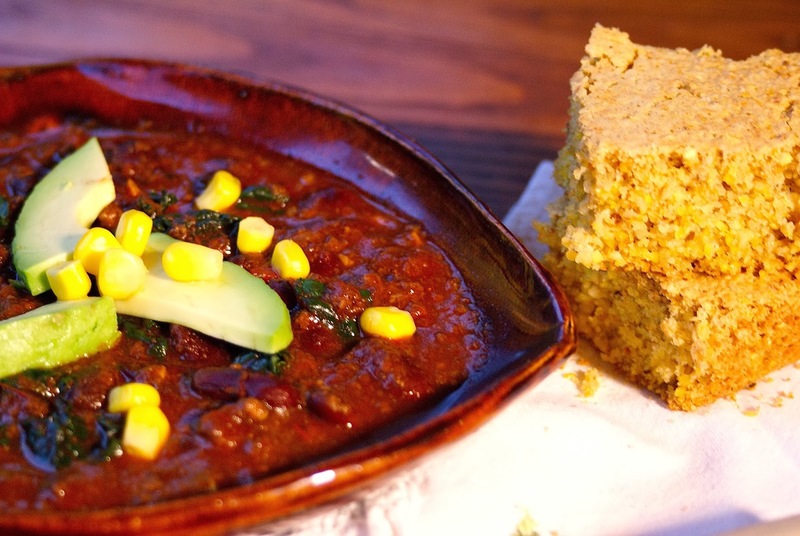 Cornbread is the perfect compliment for a good bowl of chili. Actually, a good sourdough bread is also a great option, but I have to think a day in advance to make a sourdough loaf so cornbread won. I love using oat flour in baked goods so I paired fresh ground oat flour with a coarse cornmeal and the result was fantastic! 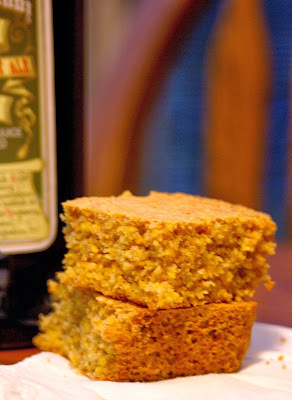 There is a little bit of a crunch and a wonderful light and fluffy consistency. I think it’s important to note that when I cook with meat, of any kind, I make sure it is organic, free-range, and grass fed. The more local the better. This recipe can easily be made vegan without the meat. I process tempeh to make it into a ground-meat like texture and cook it the same way I cook the ground beef. It’s so good! 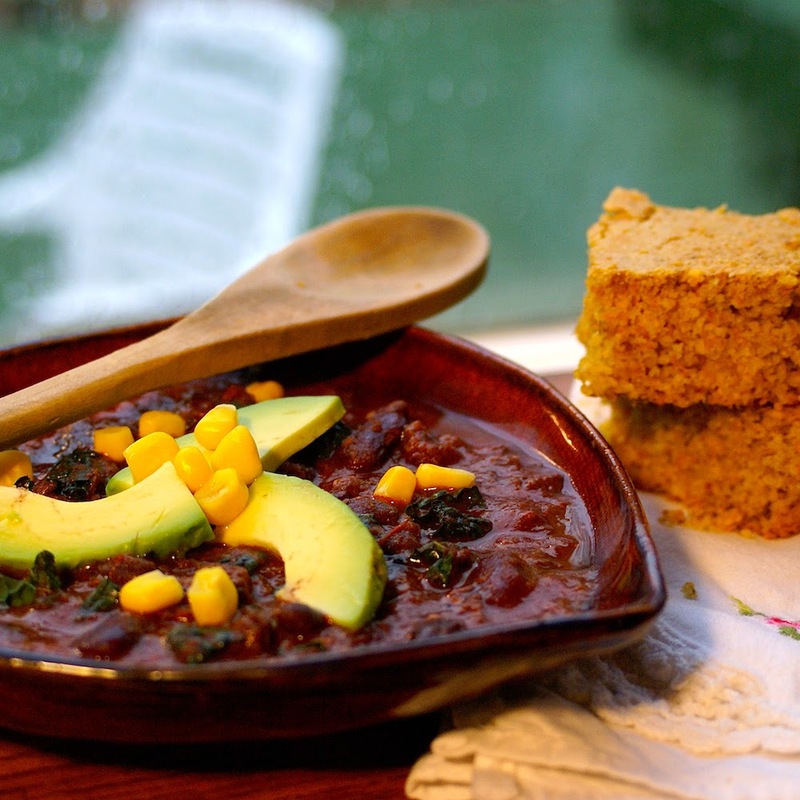 You can also ditch the meat altogether and make this an amazing bean chili! If you are using tempeh or just beans, you need to use oil to saute the vegetables instead of relying on the natural fats in the meat. Whether you make this recipe with ground beef or ground tempeh, it is truly a unique and delicious chili. So grab a beer, pile three or four pieces of cornbread on a napkin, throw on some avocado slices, and dig in! 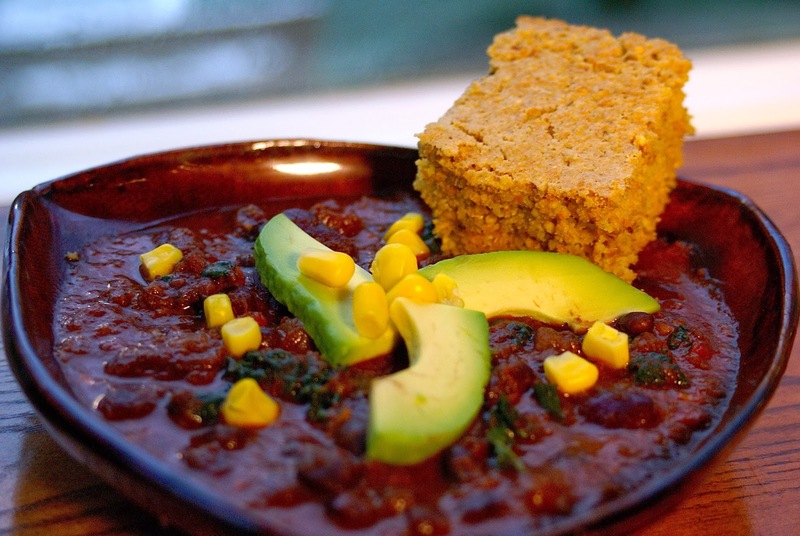 * To make this recipe vegan, make your own faux meat by processing one – two 8 oz blocks of tempeh in a food processor. Cook ground tempeh according to directions for the ground beef. You can also just make this chili with the ground beans. 1. Add ground beef, diced onions and peppers, and chopped celery and carrot to a large pot. Saute until the beef is almost cooked, then add the garlic and finish cooking the beef. 2. Stir in chili powder, cumin, paprika, cayenne pepper, and one teaspoon of salt. Add crushed tomatoes, tomato paste, and broth. Bring to a boil, then cover and let simmer (stirring occasionally) on low for 4-5 hours, or until beans are tender. Take the lid off for about an hour before done to allow some of the water to evaporate. Add additional salt and pepper to taste. If adding kale, stir in and let cook for 5-10 minutes before serving. * 1 flax-egg = 1 Tbsp ground flax seed + 3 Tbsp water. Let sit for 5 minutes after mixing to gel. 1. Preheat oven to 425 F and grease a 8″x8″ pan. Add vinegar to almond milk, stir, then set aside to let curdle (almond buttermilk). 2. Whisk together oat flour, cornmeal, baking soda, baking powder, and salt. In a separate bowl, whisk together egg, maple syrup, vanilla extract, and almond buttermilk. Slowly add the dry ingredients to the wet and stir until just combined. 3. Pour into prepared pan and bake for 20-22 minutes. Let cool for 5-10 minutes before cutting.